Local Economic Development (LED) offers local government, the private sector, the not-for-profit sectors and the local community the opportunity to work together to improve the local economy. It aims to enhance competitiveness and thus encourage sustainable growth that is inclusive (World Bank). Private sector plays an important role as an engine of economic growth and job creation in developing countries. It provides goods and services, generates tax revenues to finance essential social and economic infrastructure, develops new and innovative solutions that help tackle development challenges and it is a central actor in addressing climate change. As such, the private sector is an important strategic partner to help countries eradicate poverty and reduce inequalities and exclusion within broader sustainable development (UNDP). Private Sector Development is to encourage a sound business climate for investment, enhanced productivity, competitiveness, and entrepreneurship, to raise living standards and alleviate poverty in an economy. Since our early consulting days, we are involved in SME development, cluster development, fostering entrepreneurship, local economic development projects. We learned the hard way from the scratch. Limited information and limited experience at those days, but with determination it took us more than ten years to build our know-how in these fields. Today, Local and Regional Economic development and Cluster Development are among important fields we work in different countries. Working with local and/or national governments and stakeholders as beneficiaries under donor funded projects and implementing with UN agencies like UNIDO and ITC, we tackle sectorial and regional development issues, provide special expertise for clusters with our expert pool, analyse the environment, conduct diagnostic studies and needs assessments, improve networking and cooperation, analyse and develop supply & value chains, develop strategies and recommendations, develop tailor made training programmes and deliver training, prepare action plans and implement together with locals, successfully. At the beginning, it is vital to understand what is a cluster? Clusters are drivers of innovation, regional development, entrepreneurship, internationalisation and competitiveness. Analyse their economic, social and ecological environment to lay down strategies for a sustainable and successful future for the businesses and people. Prepare plans, set priorities and key performance indicators for success. Help them increase their human capacity by providing special training for clusters. Implement plans together with the stakeholders. EFQM® and TURQUALITY® Programs are excellence frameworks about how to best improve the performance of your organisation. TURQUALITY® is an ambitious project associated with bringing “Turkey” and “Quality” concepts together. The project is initiated by the Turkish Government, Ministry of Economy, Turkish Exporters’ Assembly (TIM), and Istanbul Textile and Apparel Exporters’ Association (ITKIB). The initial legal framework was laid out publicly on January 12th, 2004. TURQUALITY® is basically an accreditation system, which is designed not only for elevating the beneficiary companies to the level of international benchmarks, but also creating awareness on the internationally accepted values like quality and novelty that are actually carried by these brands. As a “national brand-building program”, TURQUALITY®’s goal is to facilitate and support the success of Turkish brands on international arena. To achieve these ambitious goals, TURQUALITY® program will broaden its vision to the wider concept of “quality in brand management” and emphasize its support services component with the inclusion of highly customised strategic coaching and consulting. 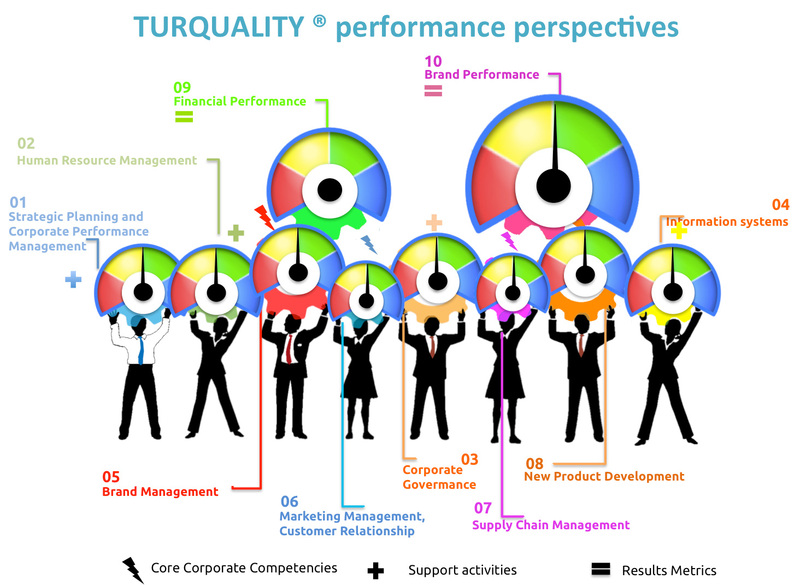 To support companies in their brand-building efforts, TURQUALITY® helps them to develop essential capabilities, competences, skills and resources necessary to fulfil such a complex commitment through both group and individual activities. VEGO is an accredited service provider of the TURQUALITY® programme and is your excellent partner in developing your essential capabilities, competences, skills and resources in your way to get prepared for and during your TURQUALITY® journey. Business Excellence is a management philosophy which can be adopted by an organisation and it is based on continuously improving the performance of the organisation while ensuring that the needs and demands of all the stakeholders are often not only met but realised over their expectations, in everything that the organisation does. There are various Business Excellence Models used all around the world in numerous organisations with great versatility, and these models are usually based on total quality management (TQM), continuous improvement, business excellence, best practices and benchmarking. To give a few examples around the globe: The Australian Business Excellence Framework, Baldrige Criteria for Performance Excellence, The Canadian Framework for Business Excellence, The EFQM Excellence Model, Deming Prize, The Singapore Quality Award Framework are well-known and widely applied frameworks and models on business excellence and quality. A Business Excellence Model is an overarching framework for management, integration and application of a range of improvement programs, initiatives and quality tools within an organisation. Business Excellence Models present a framework which is specifically designed to assist organisations achieve business excellence by continuous improvement in its overall management and in deployment of all processes while introducing the use and/or creation of best practices throughout the organisation. One of the most remarkable feature of widely accepted business excellence models is that they allow you to compare or ‘benchmark’ your organisation with others, internally or externally, through calculation of your model score against a number of criteria. Your assessment results can be very beneficial since they will most likely reveal the true strengths and weaknesses of your organisation and will highlight the way to continuous performance improvement, and so generate “business excellence”. In terms of Business Excellence in Turkey, the EFQM Model which was developed by the European Foundation for Quality Management (EFQM) has been widely adopted and it has been used as a management and corporate performance improvement framework and an evaluation tool for nearly 20 years by various organisations. Turkish Quality Association (KalDer) is EFQM’s national cooperation partner. So, whether the subject organisation is a governmental body, a university, a hospital, a large corporation or an SME, excellence philosophy can be adopted and applied in order to continuously improve the organisation's performance and surpass the needs and expectations of all the stakeholders’. EFQM Excellence Model is the model behind the European Business Excellence Award, which is an award process run by the EFQM. As previously mentioned, this framework is used as the basis for national business excellence & quality awards across Europe, including Turkey. Model assessments can be used as an organisational self-assessment. The assessment also enables you to compare your results with other organisations (and your competitors as well) at the national and international level and better learn your competitive position. It provides you a unified and common framework to learn and share ‘best practices’ in your own organisation and others. It also provides an objective assessment of your organisation’s current situation from a third party’s view (in case of assessment was conducted through independent evaluators). Furthermore, it enables you to gain public recognition and appreciation, if you are awarded to a quality or excellence award. If you are an SME, adopting and applying business excellence models can be particularly beneficial, since it will enable you to develop systems that will support your growth and performance improvement in line with your strategies. In fact, it is more likely that you will obtain significant operational and financial benefits earlier than big organisations since you can act more quickly in your decisions and responds while running your organisation. Business Excellence Models can help you understand your organisation better as a whole and allow you to make your decisions in the light of good judgement. It enables you a framework to align all your systems, processes, functions and units towards your target business results. It also enables all the people of your organisation to reach a common viewpoint of the current situation of your organisation and its main problems. This can be very important since only after that, people can truly come together and work towards resolving the difficulties and moving forward. It supports you to implement an extensive system for quality and improvement such as internationally accepted standards like ISO, Balance Scorecard, Lean, Kai-Zen, etc… The choice of most appropriate system is up to you. Excellence and quality models like the EFQM are recognised as effective tools for performance improvement and sustainability in corporations, however non-profit organisations (NPOs/NGO’s) MAY have some difficulty in implementing these models. Actually, these models are quite relevant to non-profit organisations too cause they have similar needs as profit corporations have. For example they also have clients that they offer their products and/or services, they have to gain revenue to continue their operations, they need to promote themselves and their products/services and certainly they are concerned with the satisfaction level of all of their stakeholders. Therefore, non-profit organisations are increasingly paying more attention to their organisational sustainability, particularly due to the need of overcoming the challenges of the current dynamic and complex operating environment that they are in. Issues such as uncertainty of government funding and the decline of private donations due to economic difficulties, coupled with growing competition within and outside the sector, render the survival of non-profit organisations to a more difficult task. Accordingly, increasing performance improvement is considered to be an effective approach to respond this though environment and they use these models as a strategy for performance improvement aiming to enhance sustainability. Excellence or Quality Models can be used by non-profits and benefit them as self-assessment tools and as planning tools for performance improvement. The benefits of using such a model will also be quite similar with for profit organisations. The model assessments will help to understand the organisation better as a whole, learn best practices, compare results with similar other organisations; and, provide them a plan or framework to follow towards quality and improvement. It should also be noted that integrating quality and performance improvement in a cycle of continuous improvement process, as in the excellence and quality models, can be difficult to grasp for non-profit organisations. This is partly due to their concerns on following the mission and purpose of the organisation and partly due to the terminology used in these models. For example, researches made by Kotler and Lee’s (2005) shows a strong alignment between corporate social responsibility and the non-profit organisations’ missions, especially when definition of corporate social responsibility involves organisations focus on improving the community. CSR efforts seem to be a more natural fit for non-profits than for-profits since they are more concerned with improving the community for everyone. However, when non-profits focus on CSR activities or promote their CSR activities, they can be seen as moving away from their core mission and purpose which may cause them to lose support. So, the excellence or quality models can surely benefit non-profit organisations, but perhaps better with some adaptation for their specific concerns and needs. VEGO is your excellent partner in your excellence journey, for performance improvement and surpassing your stakeholders' needs in everything your organisation does. We know that there are several business excellence models and other relevant management frameworks which are developed in different parts of the world, targeting performance improvement, quality and excellence in both management and operations. 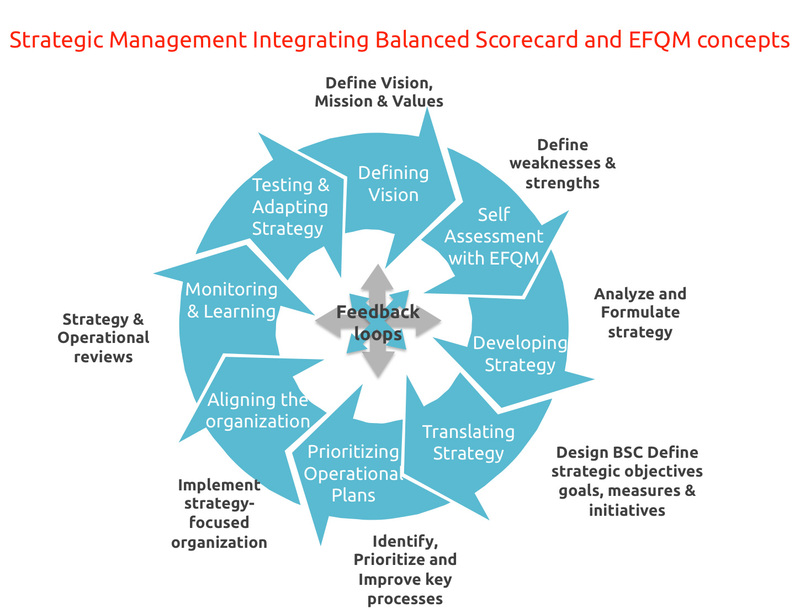 Among them Balanced Scorecard (BSC) and European Foundation for Quality Management’s (EFQM) Excellence Model, which are both widely known and adopted, are often considered to be complementary ways of monitoring, measuring and improving performance. And it is often suggested that they work together quite well to bring added value to an organisation. First of all, they have significant similarities. Both are established above a solid commitment (initially the management’s ownership and commitment to follow) on performance improvement, each follows a structured process and are both measurement based. They also both seem to seek an invisible cycle of planning, designing, implementing, reviewing, learning and using feedbacks for improvement. Furthermore, they are extensively used not only in business organisations but also in various governmental institutions and non-profit organisations. The success and continuity of both approaches application within an organisation highly depends on the management’s commitment and their success in spreading and making the people of the organisation adopt the frameworks. 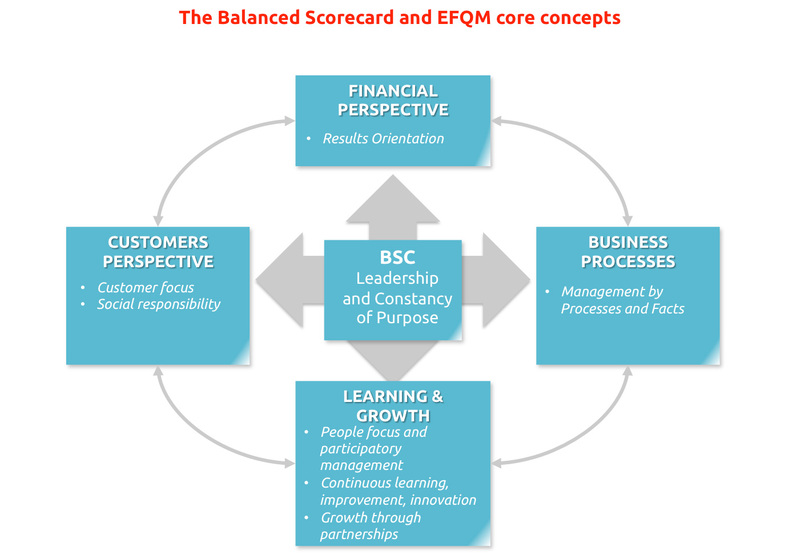 HOW BALANCED SCORECARD AND EFQM CAN USED SIMULTANEOUSLY AS AN INTEGRAL MODEL? focus the time and the efforts of the management team on key topics and issues. create a direct link between individual’s, units’/teams’ and the overall organisations’ goals in order to create ensure strategic continuity. Although both EFQM Model and BSC seem to have similarities, they also have different strength areas which makes complementarily adopting and applying two approaches together quite logical and beneficial.